Disney's $52.4 billion deal to acquire a significant portion of 21st Century Fox has earned the blessing of President Trump, though he reportedly first needed to be assured that Fox News wouldn't change hands. 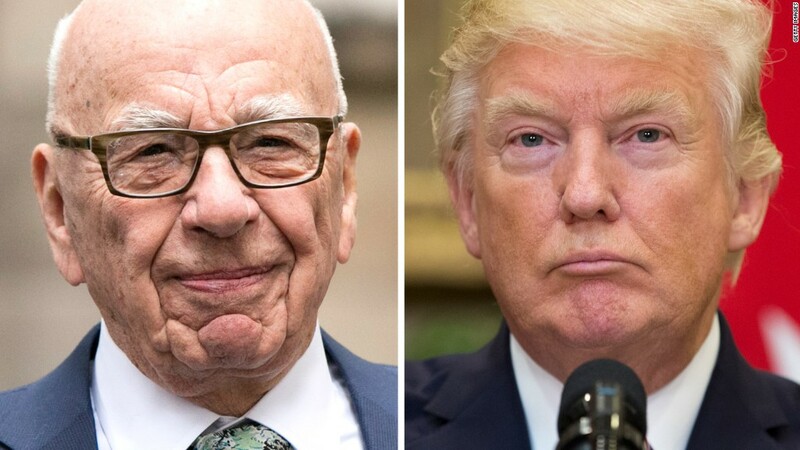 White House press secretary Sarah Sanders said Thursday that Trump had spoken with Rupert Murdoch, the billionaire patriarch of the Fox empire, to congratulate him on the sale. "I know that the president spoke with Rupert Murdoch earlier today, congratulated him on the deal. [He thinks] that, to use one of the president's favorite words, this could be a great thing for jobs, and certainly looks forward to and hoping to see a lot more of those created." The deal with Disney is a potentially transformational move in the world of media, and serves as a decisive turn in the long career of Murdoch. It has also produced another compelling chapter in Murdoch's topsy-turvy relationship with Trump. But Trump's assessment of it might not be right. In announcing the deal, the companies said they would save at least $2 billion by making their businesses more efficient. They didn't specify how they plan on saving money, but mergers between competitors often involve job cuts because of overlap in job functions. Rich Greenfield, a BTIG analyst, said he expects most of these savings to come from layoffs. "There will be thousands of jobs lost," he said. "It is hard to see how any meaningful job creation will come out of this." Needham & Co. analyst Laura Martin agreed, saying job cuts are inevitable in the short term as the two companies work to consolidate their holdings. "[The combined company] won't need a lot of the corporate overhead, or two distribution arms in Italy," Martin said. Still, Trump's favorable view of the deal is yet more evidence that he and Murdoch are on much better terms than they used to be. Murdoch was highly critical of Trump's presidential bid in the early days of the campaign, favoring a number of other Republican candidates. But the two have been simpatico since Trump locked up the GOP nomination. There may have been more than a congratulatory call, too. According to Vanity Fair's Gabriel Sherman, Trump spoke with Murdoch on the phone prior to the deal "to make sure Murdoch wasn't selling Fox News." When CNN inquired about Sherman's report earlier on Thursday, White House deputy press secretary Raj Shah said only, "The White House is not involved with pending mergers. I'd refer you to the agencies with jurisdiction." A source with knowledge of calls between Murdoch and Trump acknowledged that the president and Murdoch speak on a regular basis, adding, "When you're about to announce a big transaction it's fairly standard to put in a courtesy call to the White House." Neither Fox nor the White House have denied Sherman's report. Trump has apparently commented to multiple people that Fox News -- which will indeed remain under Murdoch's control -- has given him more favorable coverage under the direct leadership of Murdoch than it did under Roger Ailes, the late founder and chairman of the cable news channel, who was ousted last year over sexual harassment allegations. The president's rosy view of the Disney-21st Century Fox deal -- and his less than positive opinion of other major mergers -- can potentially be seen as an extension of his media preferences. Trump has been publicly opposed to AT&T's attempted takeover of Time Warner, which owns the president's favorite media punching bag, CNN. The Justice Department has filed a lawsuit to block the deal. As a candidate, too, Trump opposed the AT&T-Time Warner deal -- and his campaign suggested he'd oppose other such deals, too. In a statement in October 2016, shortly after AT&T and Time Warner announced their agreement, Peter Navarro, then a senior economic adviser to the candidate and now the director of the National Trade Council, released a statement in which he said, "Donald Trump will break up the new media conglomerate oligopolies that have gained enormous control over our information, intrude into our personal lives, and in this election, are attempting to unduly influence America's political process." If, after congratulating him, Trump told Murdoch that he and his Justice Department might have a problem with the deal, the White House has not said so. -- CNNMoney's Hadas Gold, Julia Horowitz and David Goldman contributed reporting.